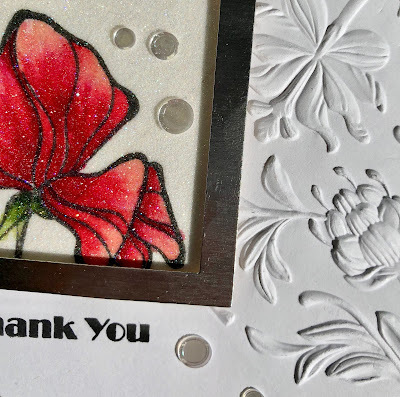 I masked off the centre of a 4 /14" x 5 1/2" white card stock front and stamped the large bloom from the Altenew Peony Bouquet stamp in Altenew Permanent Black Crisp ink. 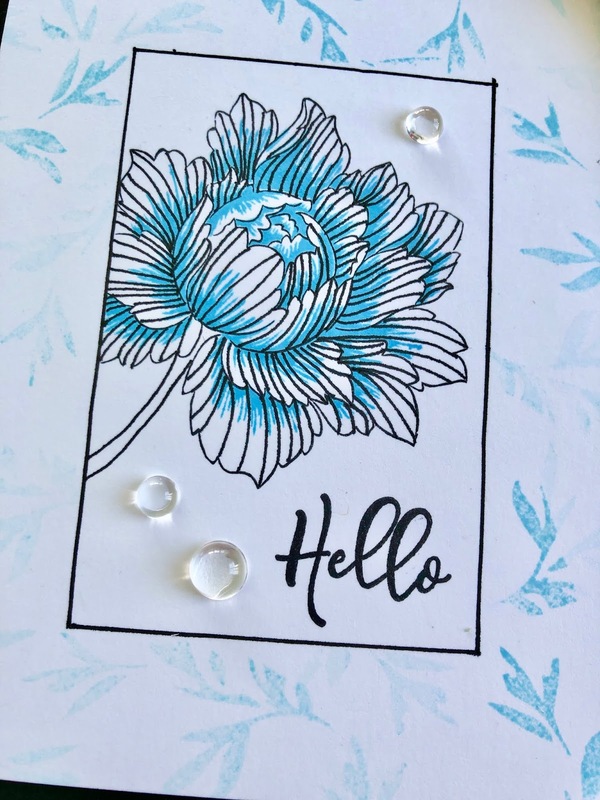 I then stamped the second layer of the floral in Altenew Turquoise Crisp Dye Ink. I then "tangled" the flower with a Pigma Micron .01 black pen, outlined the frame with a Pigma Micron .05 and a ruler and stamped a leaf in Altenew Sea Breeze crisp dye ink from the Wildflower Garden stamp set. 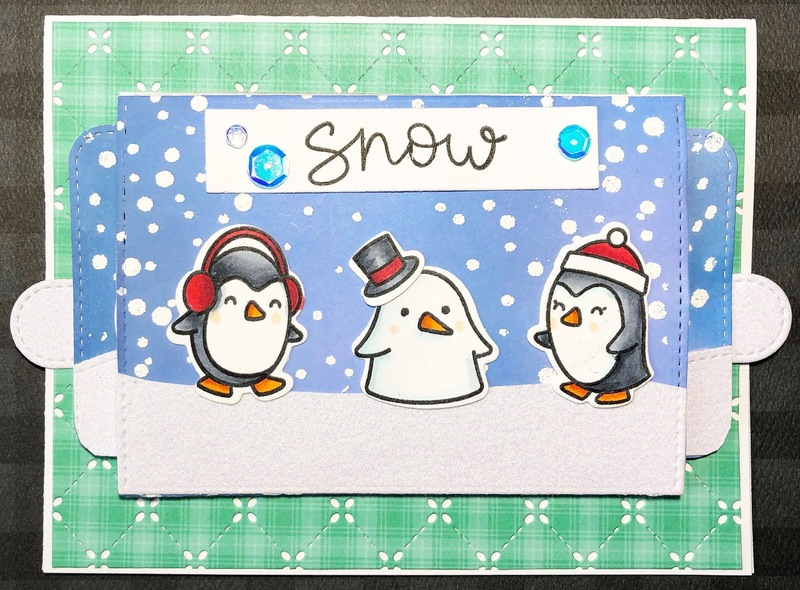 The panel was trimmed to size and then mounted on a black card stock base. 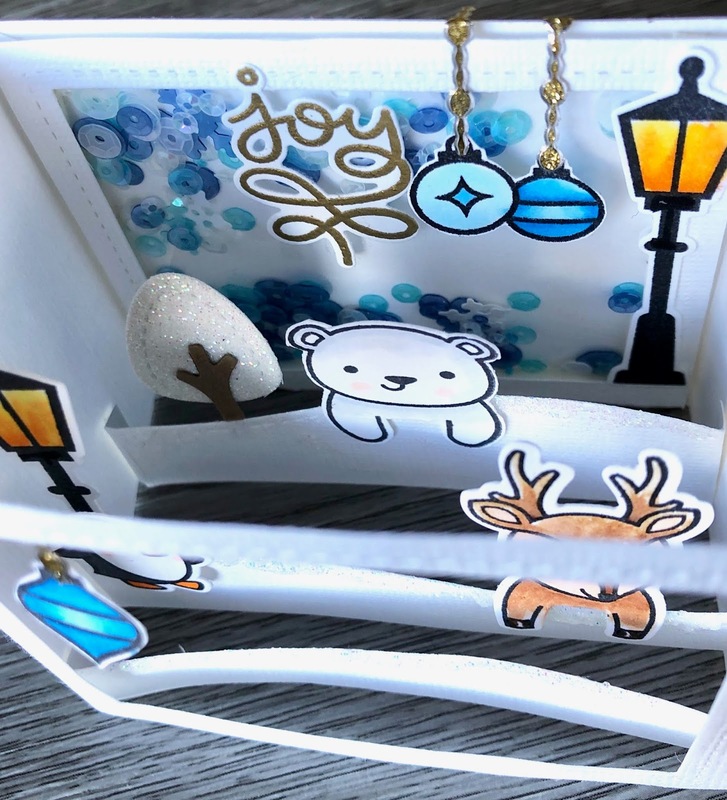 Clear Studio Katia drops are adhered with liquid glue for the final embellishments. So looking forward to the next lessons in the class! Thanks for stopping in! 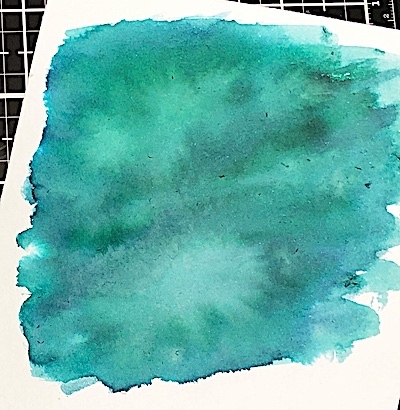 I created a night sky with Distress Oxide inks in Shaded Lilac, Salty Ocean and Faded Jeans. 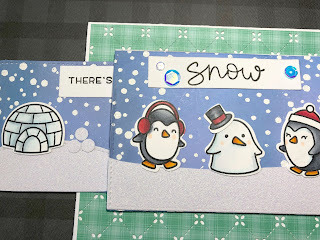 I then stamped the snow with the snow stamp from the Snow Cool set in embossing ink and then heat embossed with Lawn Fawn textured embossing powder. 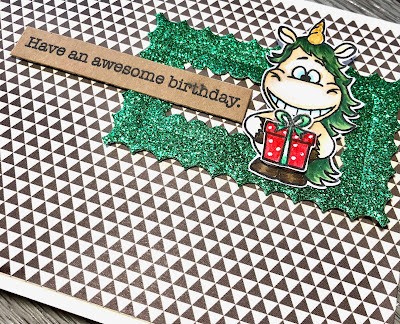 I die cut white glitter card stock with the Lawn Fawn Stitched Hillside borders for the front and slider panels of the card. 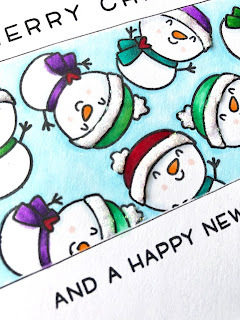 All images are coloured with Copic Markers, I used a hole punch to punch "snowballs" from the glitter card stock. 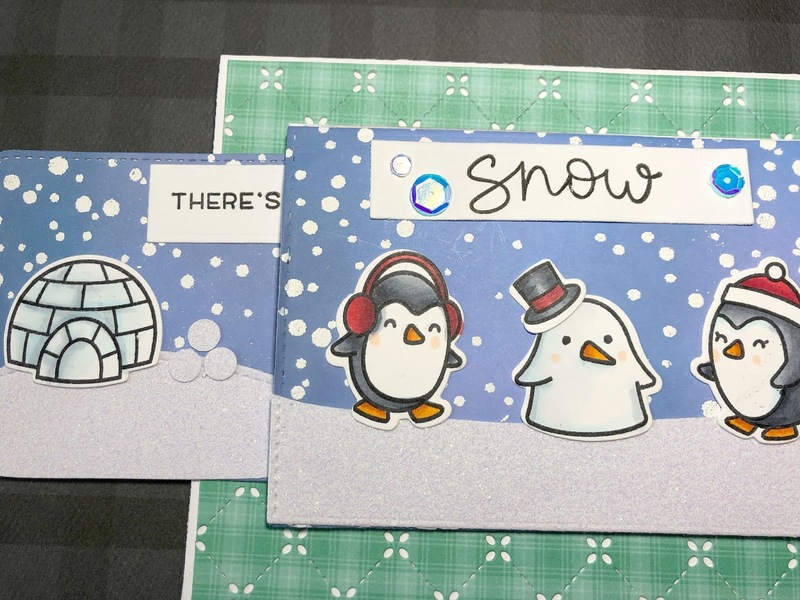 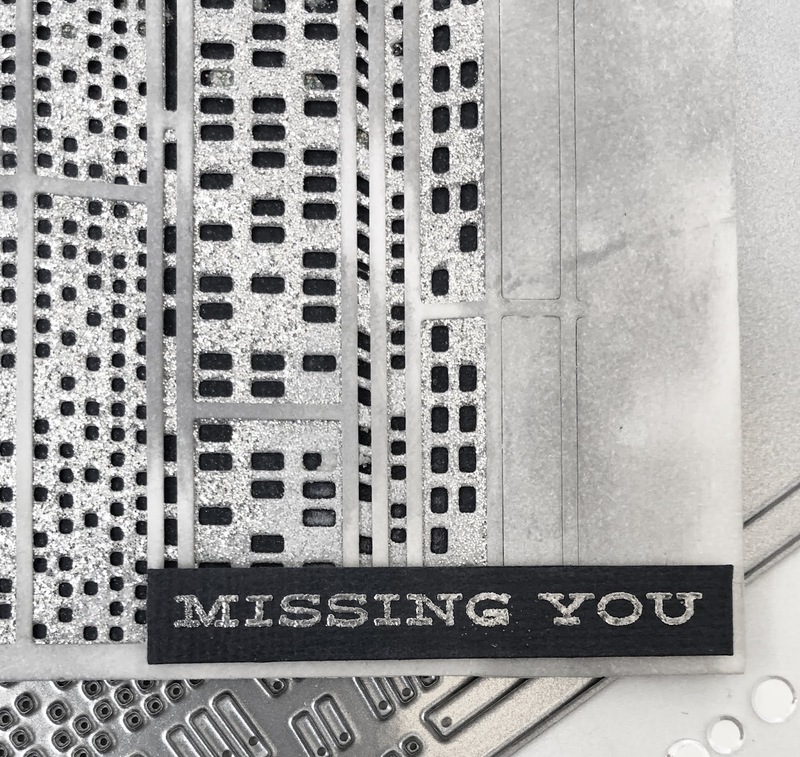 Lastly I stamped the sentiment from die cut strips cut with the rectangle die in the double slider die set and spread them across all three panels. 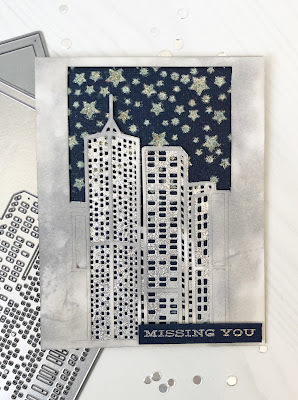 I am here to share a card inspired by the Altenew One-Layer Wonders class. 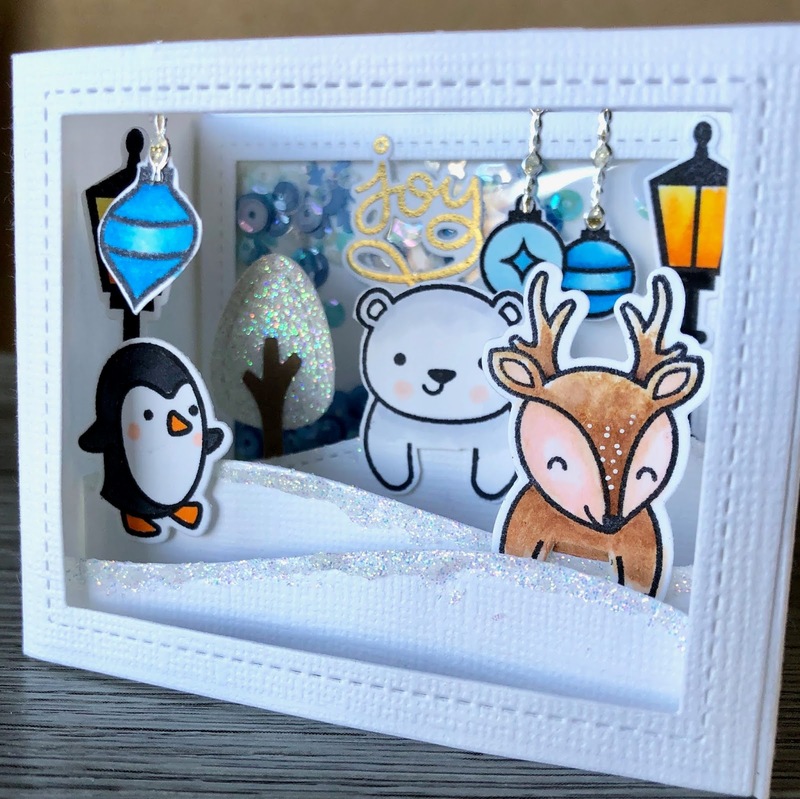 All of the classes have been fabulous but I think this is my most favourite of them all! 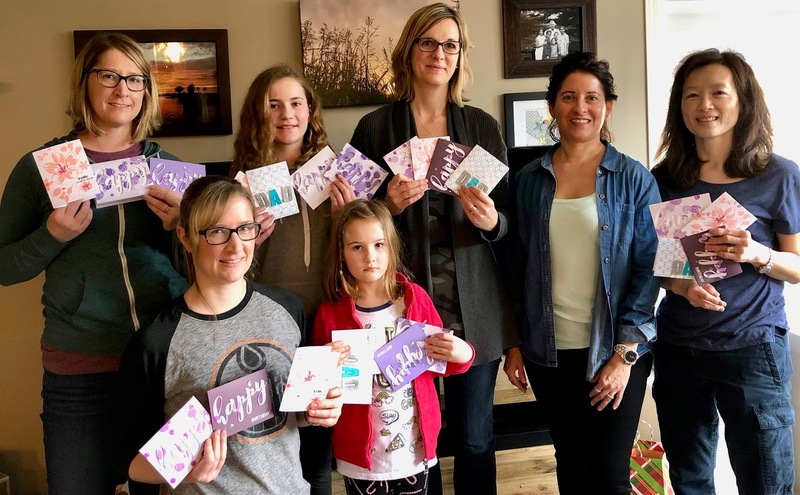 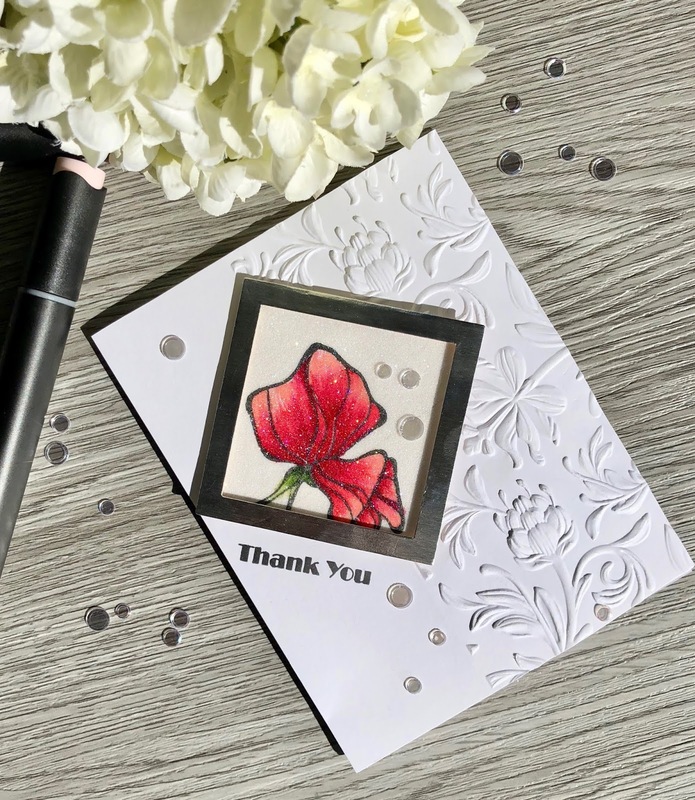 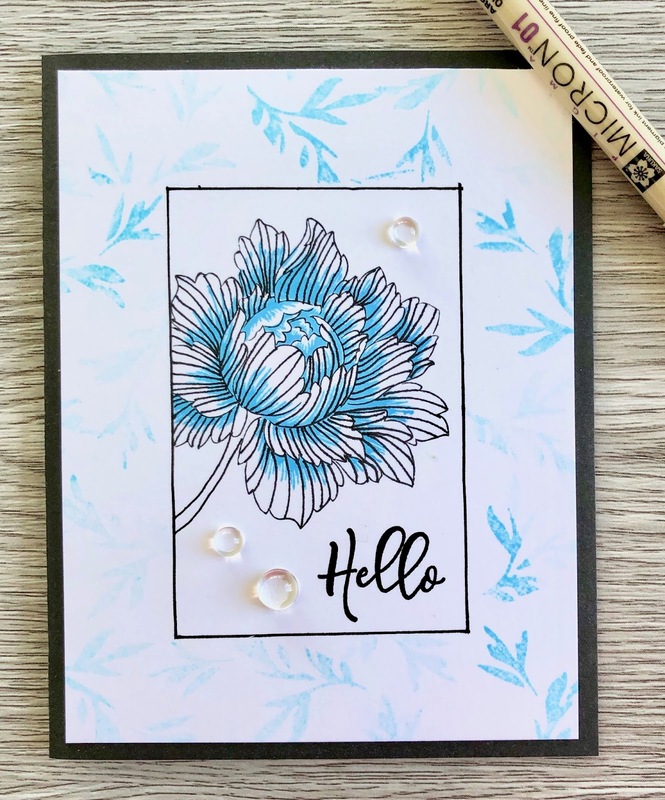 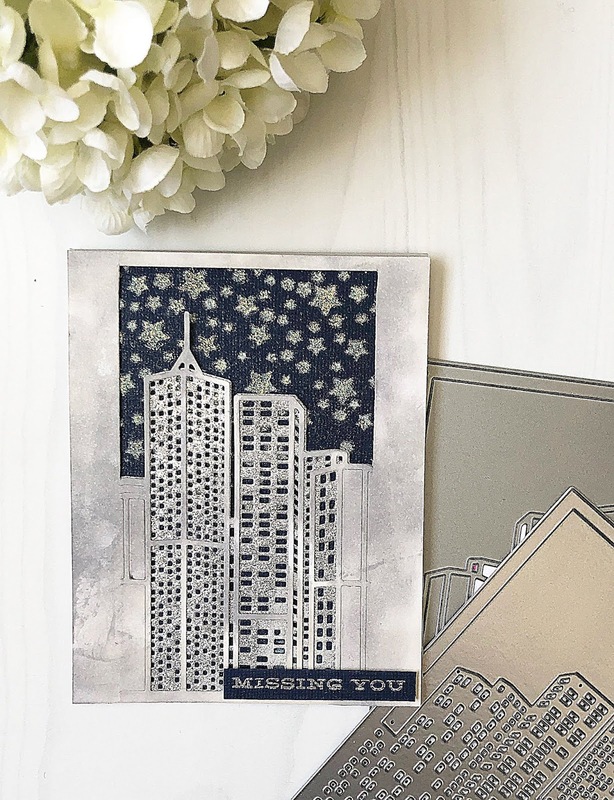 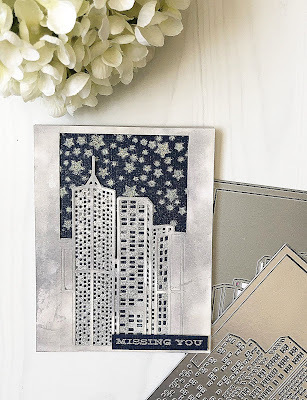 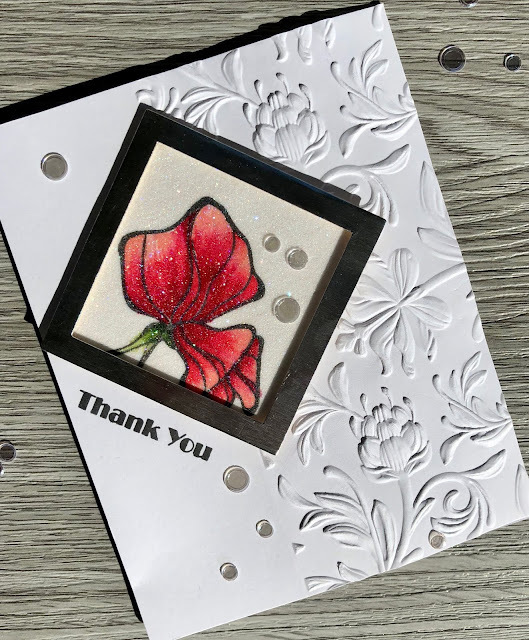 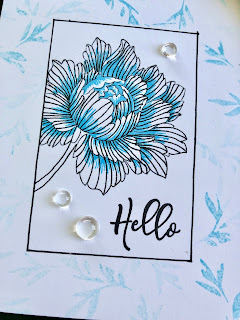 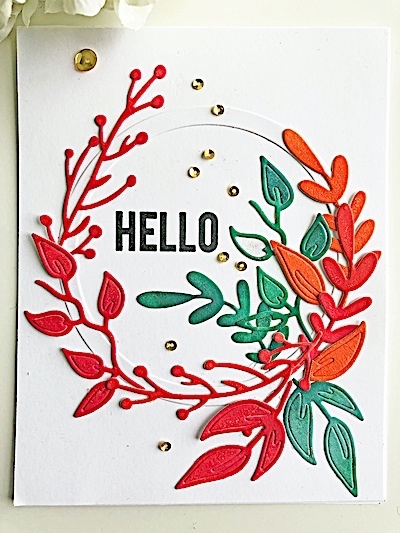 I have seen so many lovely cards with pattern stamping I couldn't wait to give this lesson a go! I began by stamping the sentiment in Midnight Violet and Volcano Lake Crisp Ink, then adhered a 2"wide Post It tape mask over the stamped sentiment. 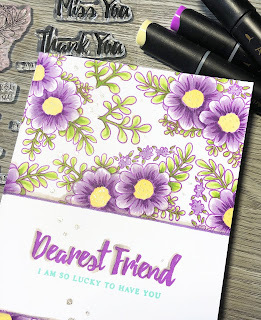 Next, I stamped the smaller floral image from the Altenew Dearest Friend stamp set in Midnight Violet Altenew Crisp Ink. The flowers are then coloured with Altenew Artist markers in R702 Lavender Fields and R705 Midnight Violet. Leaves are colored in G702 Frayed Leaf and G715 Forest Glades. I've added a shadow with WG01 Morning Frost on the edges of the sentiment block and sentiment itself. 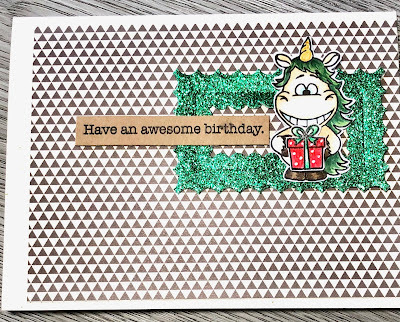 It's hard to tell from the photo but I added some dots with a Wink of Stella Clear Glitter marker for a bit of shine that keeps this a one layer card. 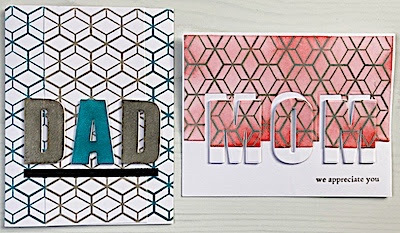 I am playing along with the latest Lawn Fanatics challenge, shaped cards. 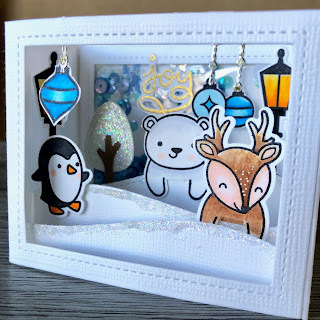 I decided to make a shadow box/shaker card. 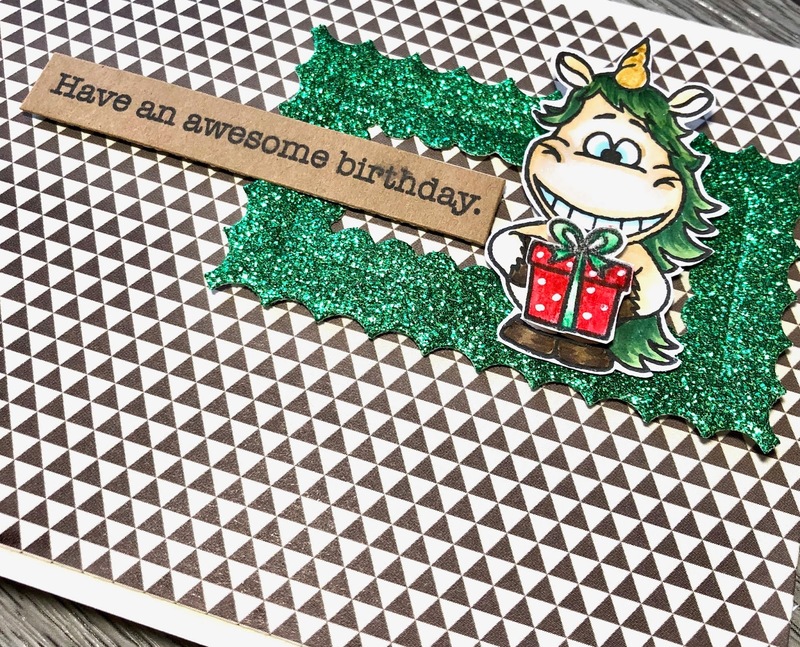 I added Nuvo glimmer paste to the tops of the hills and also added a 3rd hill. 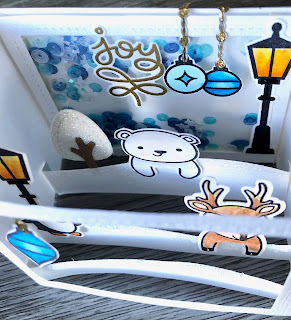 The very back panel holds a shaker window. 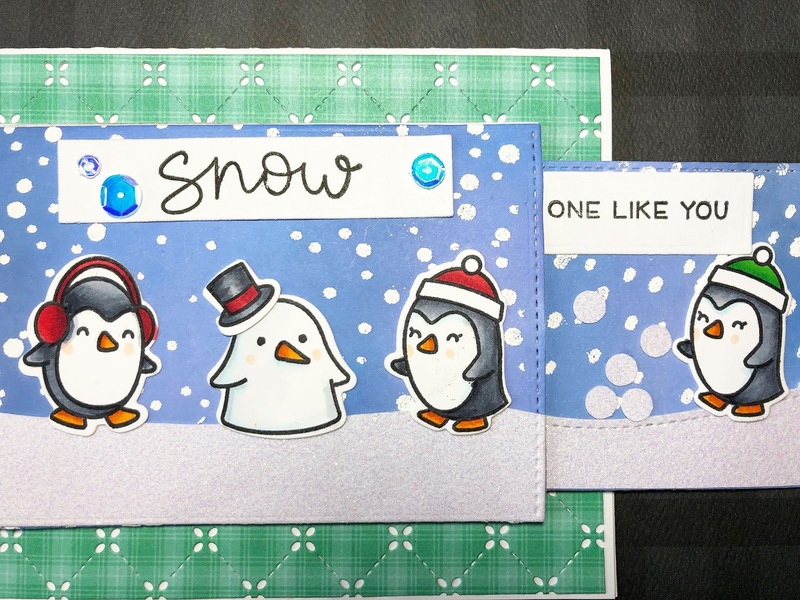 I've used images from the Lawn Fawn For you Deer, Winter Village and Simple Celebrate Winter stamp sets. 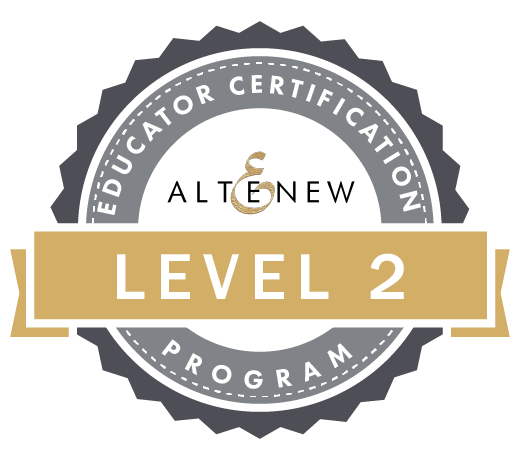 I am sharing another AECP project today and it's inspired by the Tis' the Season class at Altenew Academy. 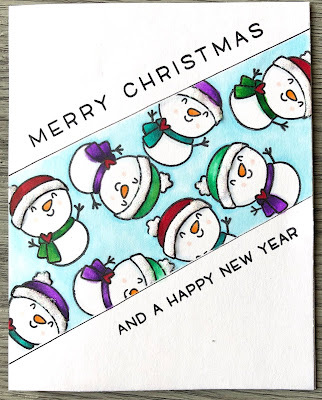 It was hard to pick one lesson to base a card on but I was drawn to the colour combination and use of non-Christmas products in Lesson 3. 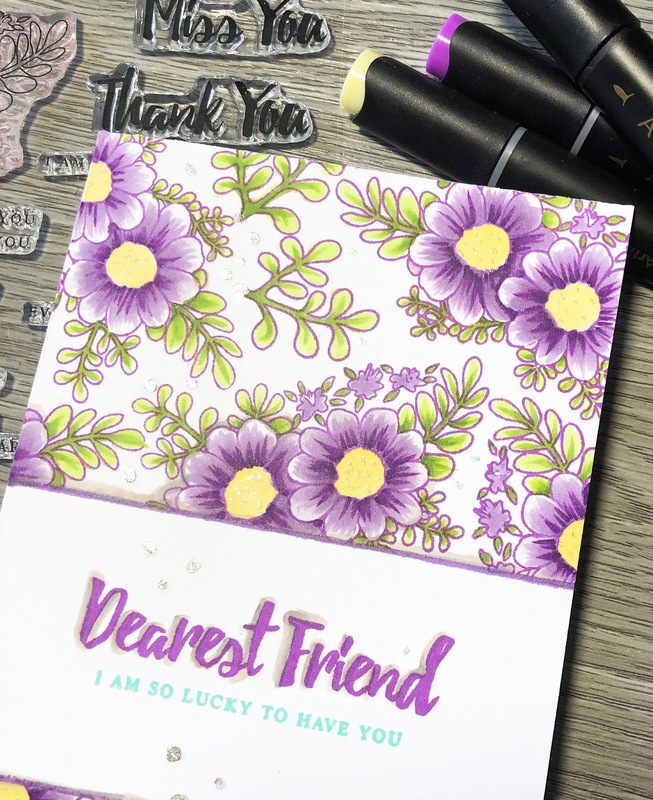 I chose to use the Altenew Calligraphy Mazes stencil and ink blend the background with Altenew Bamboo and Forest Glades ink with a touch of Frayed leaf. 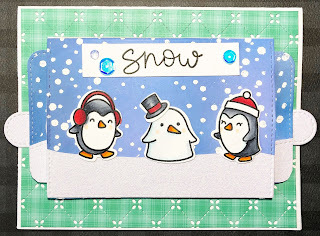 Then I blended Altenew Pinkalicious, Rubellite and Razzleberry ink on a piece of white card stock. 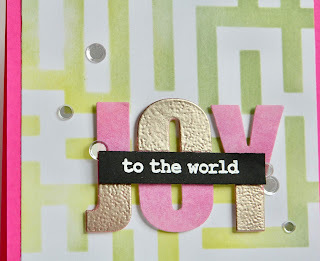 Next I die cut the word JOY using the Altenew Caps Bold Alpha. 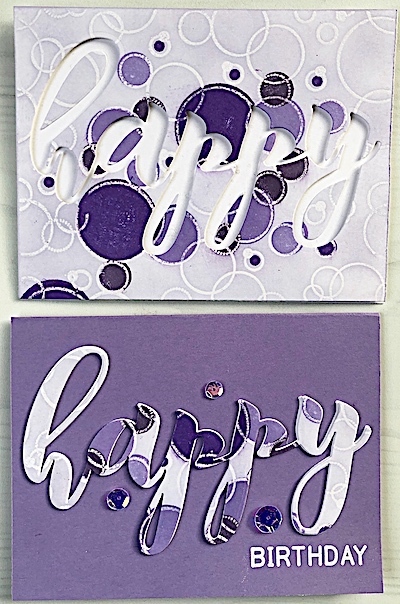 After cutting, I taped the letters off with purple tape, applied Versmark embossing ink on the exposed area, then heat embossed with Altenew Platinum Crisp Embossing powder. 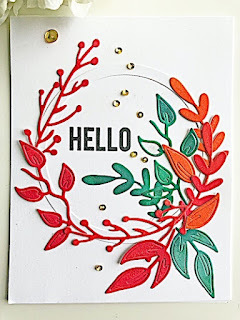 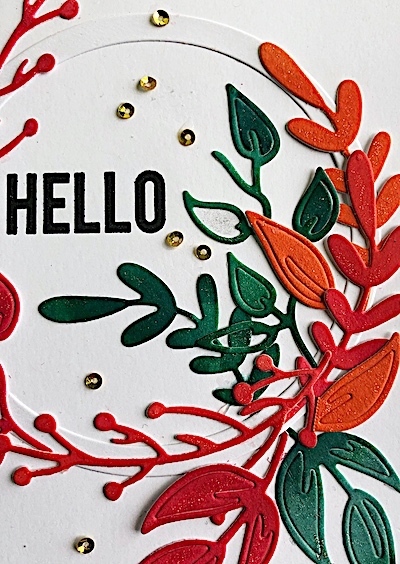 JOY was then adhered to the centre of the card with foam tape, sentiment from the Altenew Sketched Evergreen stamp set is heat embossed with Altenew Crisp White embossing powder and layered over joy with foam tape as well. 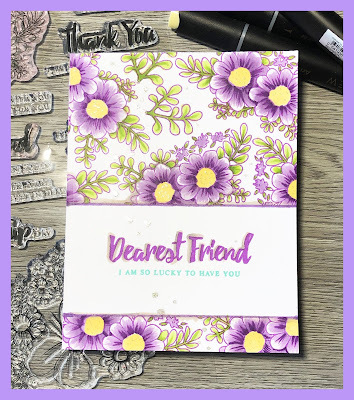 Pretty Pink Posh sparkling clear confetti finish off the card. 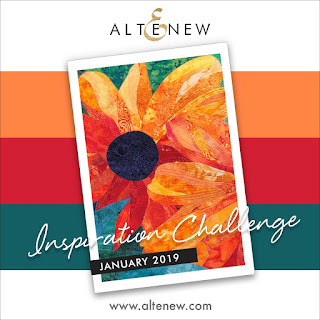 Sharing this card inspired by Lesson 5 of the Altenew Academy For the Love of Colour course. 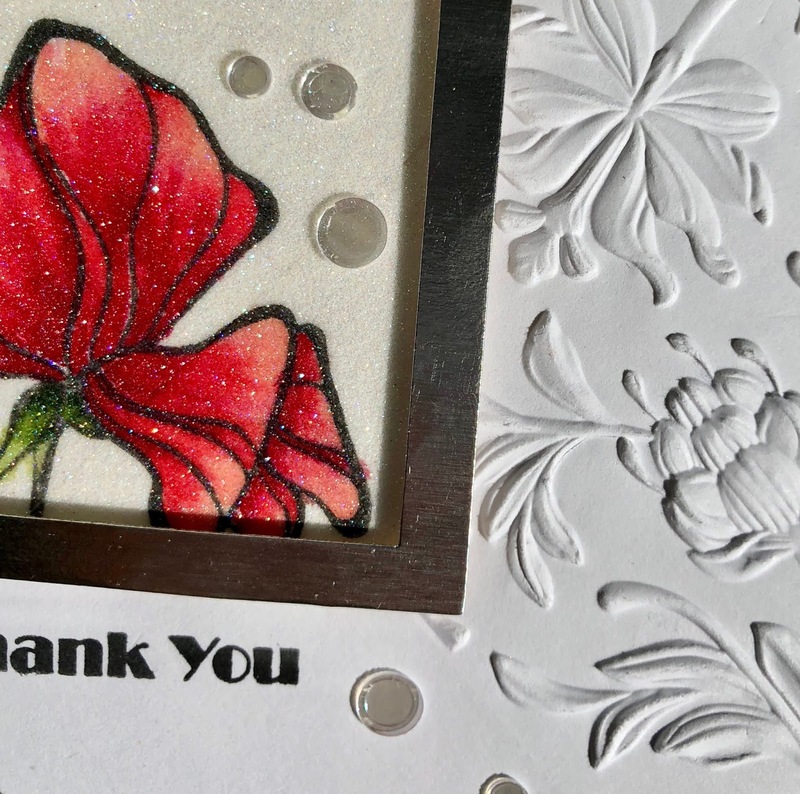 I LOVE glitter so making a card with it was a no brainer for me 😄. 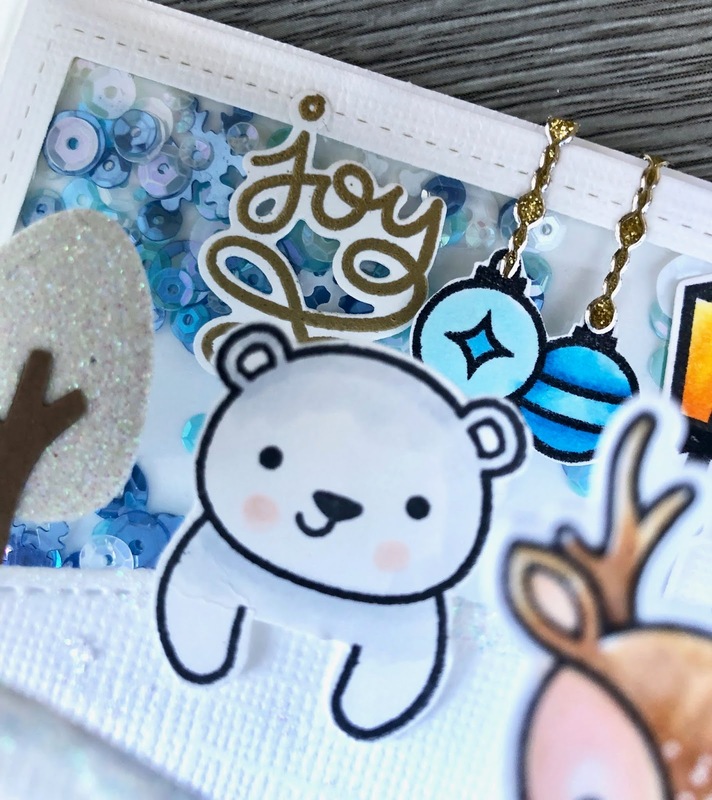 To create the glittered image first apply Sookwang or any double sided adhesive to white card stock. 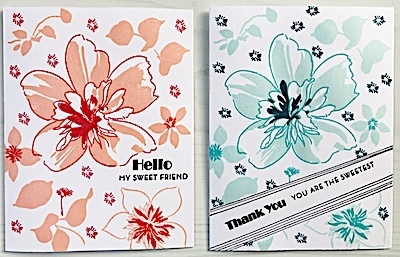 The size of card stock will be determined by the stamp image you choose. 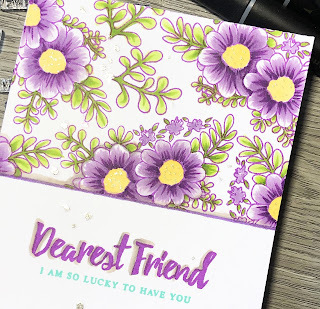 Remove the backing, sprinkle transparent microfine glitter over the adhesive and burnish by rubbing with your finger over the adhesive. Tap off any excess glitter and also wipe with a Swiffer cloth to remove any glitter that does not burnish. 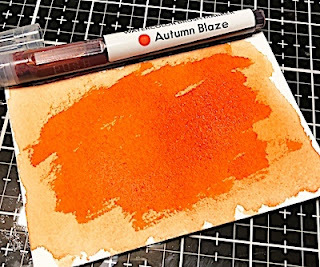 Next, stamp your image with black ink, I used GinaK amalgam ink, Altenew Permanent Black ink would work as well, both are copic friendly. 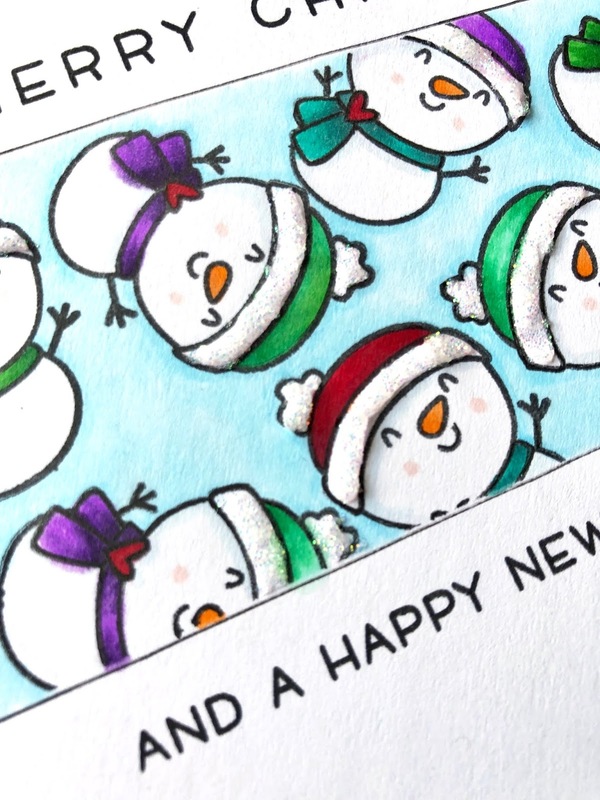 Now it's time to add colour, I used my Altenew Artist alcohol markers although the lesson suggests other types of markers. 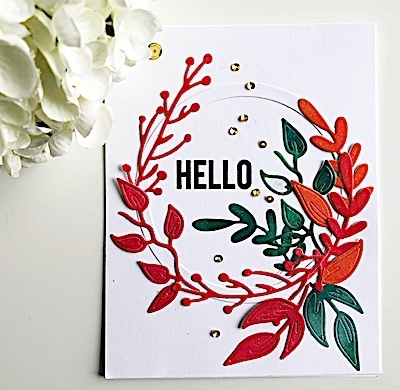 I have coloured with alcohol markers on glitter in the past but you must use a VERY LIGHT HAND to do so or the colour will feather outside the stamped image. 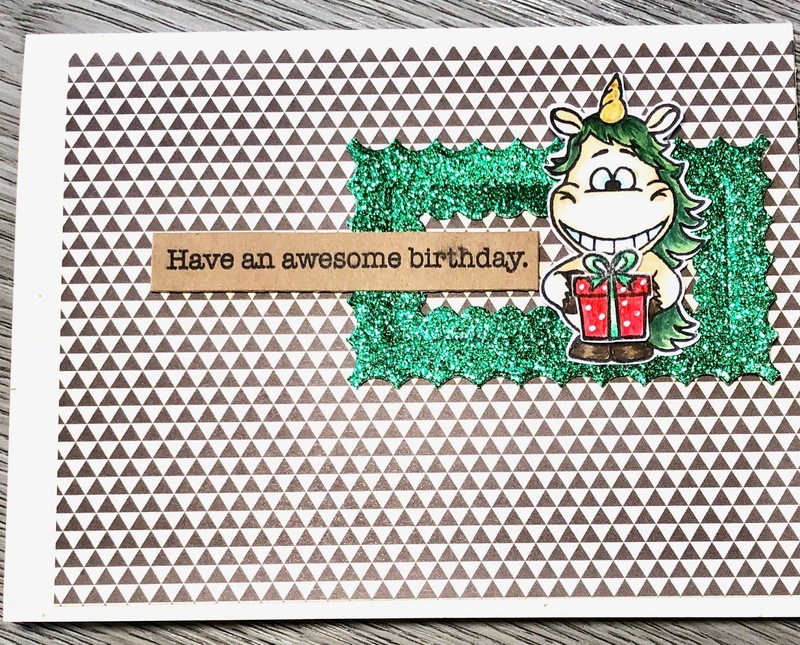 You can see the sparkle in the image above. Once the colouring was completed I taped 2 Halftone square dies equidistant from each other to create a square frame and cut the frame from silver metallic card stock. 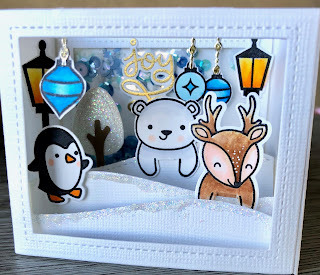 I then adhered the frame over the image with foam tape, cutting the glitter piece with scissors to fit behind the frame. 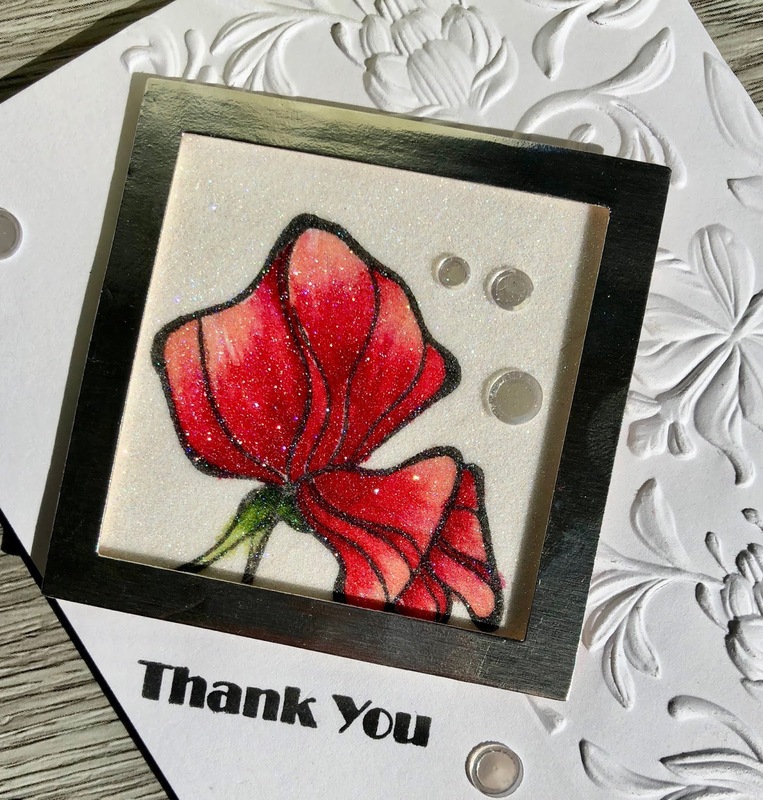 Half of the card stock base was embossed with the Tim Holtz 3d Botanical embossing folder, you can see the dimension it creates above. The framed image is then adhered to the card stock base, sentiment was stamped before adhering the image. Pretty Pink Posh sparkling clear confetti adds a little more shine to the card.